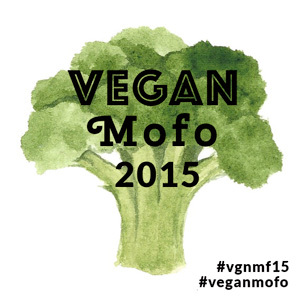 We're not even a week into Vegan MoFo 2015, and already I've had some issues. Our internet was out for a good portion of the morning which delayed so much of my work. Delayed work means delayed time in publishing MoFo posts. It's fixed now (duh), and I'm so glad to finally be able to share my recipe for the 4th prompt, Tell us about a weird food combo that you love. When writing this recipe I didn't really know if I'd love pumpkin and chipotle together. I'm a big fan of the heat and smokiness that chipotles provide, and I wondered how well those attributes would pair with the sweetness of my beloved pumpkin. It ended up being a worthwhile experiment. I knew that I wanted to make a sauce with the combo, and the idea to use it for enchiladas came rather easily. I made a quick filling with Gardein tenders, vegetables, and salsa, and got to work rolling. 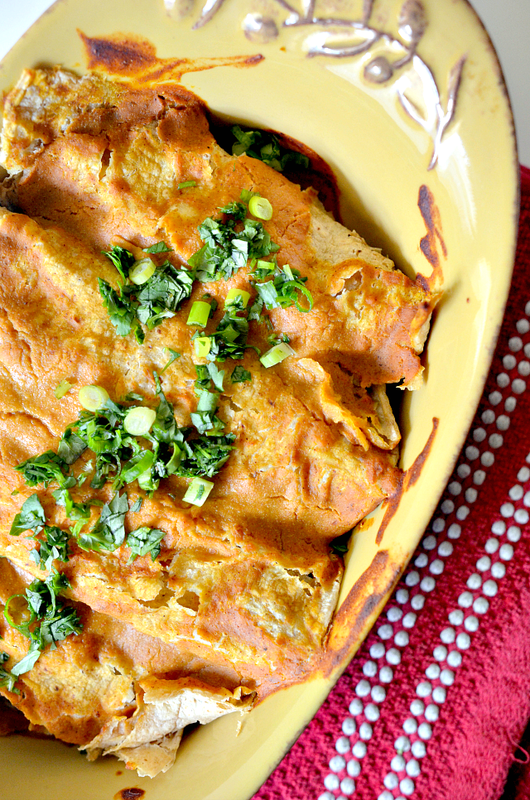 I wish I could make huge batches of enchiladas at a time, but space (and lately time) just won't permit. The good news is that making one small batch means that it's not too labor intensive. After making the sauce and filling, you just have some quick assembly before putting them in the oven to bake. It's real easy. I'm very happy to report that the chipotle pumpkin sauce came out great. It's thick, sweet, smokey, little spicy, and very flavorful. Without a doubt, it's going to be my choice enchilada sauce for the Fall. I'm so excited to see what weirdo food combos all of you MoFo-ians have come up with. I'm also really excited to share my favorite sandwich recipe tomorrow. It's a good one! 2. In a small saucepan, whisk together all of the sauce ingredients. Place the saucepan over medium heat, and whisk the sauce continuously until it thickens considerably, but is still a pourable. Remove the pan from the heat, and taste the sauce for salt. Set it aside for later. 3. Chop the cooked tenders into 1/2 inch pieces, and add them to a large mixing bowl with the zucchini, bell pepper, salsa, and 3 tablespoons of the chipotle pumpkin sauce. Stir the mixture to combine, and season it with salt to taste. 4. Preheat a cast iron skillet over medium high heat. Meanwhile, take about two tablespoons of the chipotle pumpkin sauce and spread in on the bottom of a 13X9 inch baking pan. 5. Take your first tortilla and place it on the pre-heated pan for about 10 seconds, using tongs to flip it halfway. You just want to warm it enough to make it malleable. 6. Take your warm tortilla, and add 2-3 tablespoons of the filling to the middle. Roll the tortilla up over the filling, and place the whole thing seam down into the prepared pan. Repeat this step with the remaining tortillas. 7. Pour all of the chipotle pumpkin sauce over the filled tortillas, making sure they're all covered. Spay the top of the enchiladas with spray oil, and cover the pan with foil. 8. 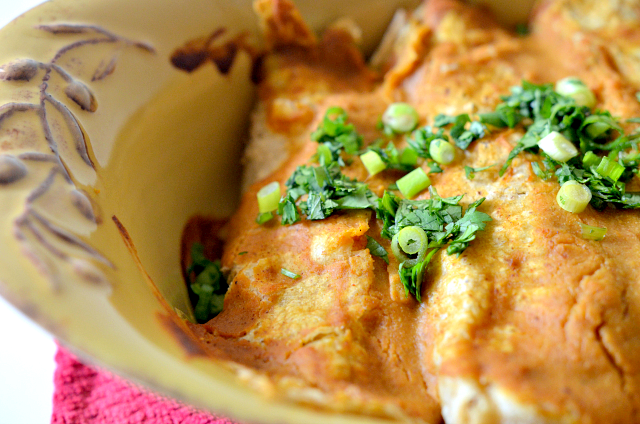 Place the enchiladas in your pre-heated oven, and bake them for 15 minutes. After 15 minutes, remove the foil and bake them for another 5 minutes. 9. 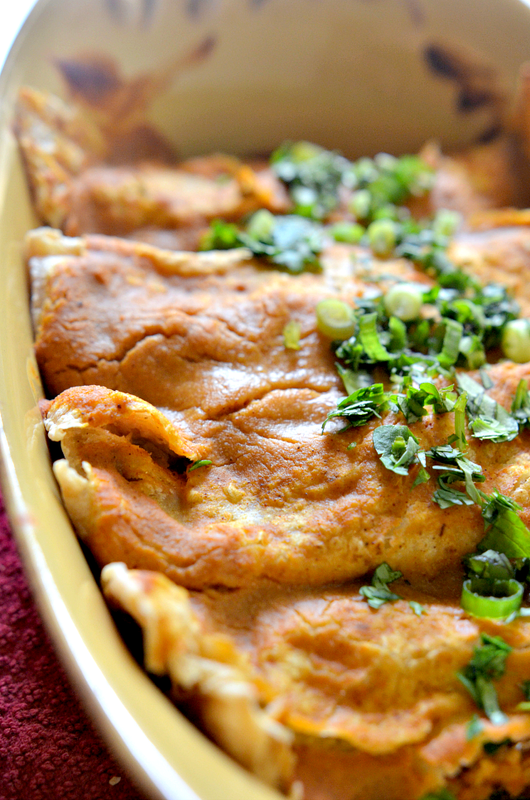 Serve the enchiladas warm and topped with scallions and cilantro if desired.